I had a lot of admirable plans for this round of Bout of Books. I was going to participate in at least one of the chats and in all of the challenges and write an update post every two days. Alas, I started off fairly well but life got busy, as usual, and I didn’t meet all my goals. But – I did read at least a little bit each day. And I read three books. So, I’ll call it a success, anyway. If you missed my first post about Bout of Books, read my read-a-thon sign up post before you read all my wrap up notes. I finished A Night in with Grace Kelly! I finished Simon VS the Homo Sapiens Agenda! I had to DNF The Tightrope Walkers. As you can see, I didn’t totally stick to my original TBR. I started The Tightrope Walkers and I really didn’t like it. I couldn’t get into it. I didn’t enjoy the macho-man attitude of the the main character’s father or the style of writing. I found the dialogue difficult to understand (it was written in a dialect of British dockworkers) and I realized it wasn’t worth it to try and force myself to read something I wasn’t enjoying. Instead, I picked up a Lumberjanes, because I’ve been wanting to read more of those excellent graphic novels for ages. It was a good decision. I really enjoyed the third Lumberjanes, laughed out loud, and sat on my front porch in the morning sunshine and sipped my tea. It was an excellent way to end the read-a-thon and my last day of weekend. I only did two challenges this time around and missed both Twitter chats (because of an exercise class that I’d already paid for and an accidental Saturday morning sleep in). Next time around, I’ll hopefully be able to participate in a few more of the activities. The next Bout of Books Read-a-thon is August 21, 2017 to August 28, 2017. 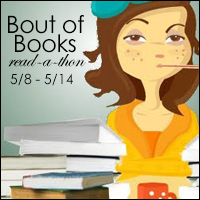 Check out Bout of Books: Schedule for all the details. How did your read-a-thon go? Do you think you’ll participate next time? It looks like you did brilliantly with the readathon! 🙂 Would you recommend the audiobooks of My Lady Jane and Simon vs the Homo Sapiens Agenda? I’m looking to expand my audiobook collection and both of these books are on my TBR so I wonder if it’s worth listening to them. You did wonderfully! And thank you for your kind words. 🙂 I loved the Simon audiobook. I would definitely recommend it. I’m not really far into Jane yet so I can’t say a lot, but it’s okay. The narrator has a very distinct voice. I’m finding it a little difficult to get absorbed into. I would also recommend the audio book of The Upside of Unrequited. It’s also by Becky Abertalli and is wonderful.